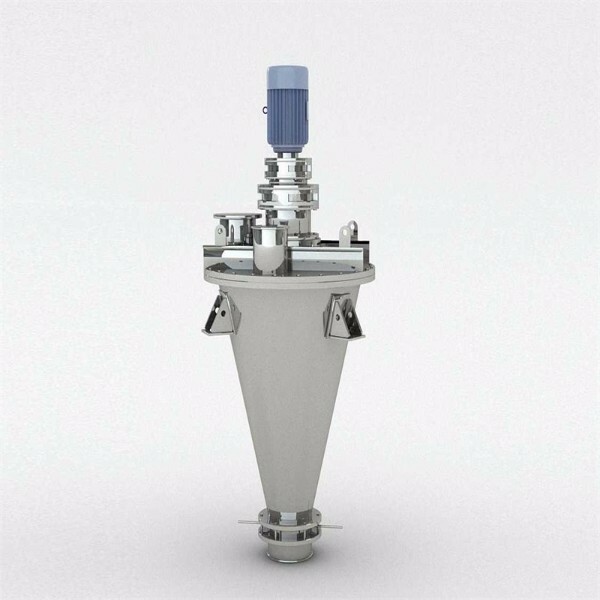 5) Displacement valve at the bottom of the convenient discharge, due to the bottom of the screw without a fixed device, so there will be no pressure feed phenomenon. (1) Transmission system: the rotation of the screw shaft and its rotation with the arm along the barrel wall revolution. Revolution, rotation using a separate drive, both parts are large speed, high efficiency stereotype cycloid reducer, bevel gear distribution and commutation, spread to the two arms. 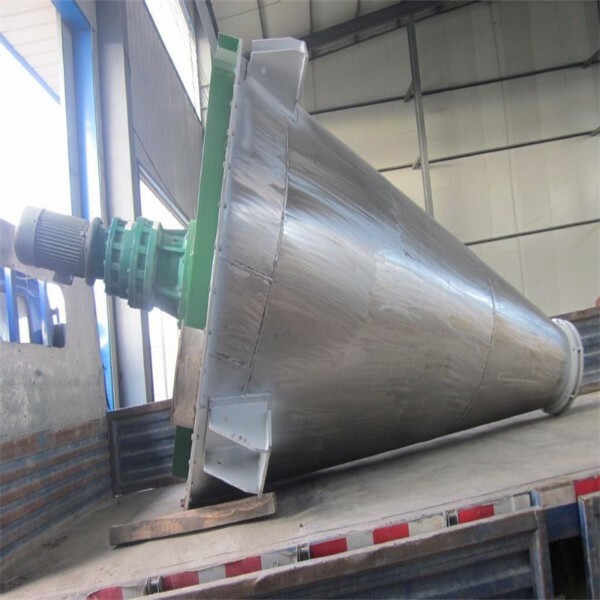 (2) Cylinder: The container of this machine is inverted conical, the purpose of which is to satisfy the requirement that the material has enough material to circulate alternately under the effect of screw lifting. Therefore, the container must have the proper cone angle. 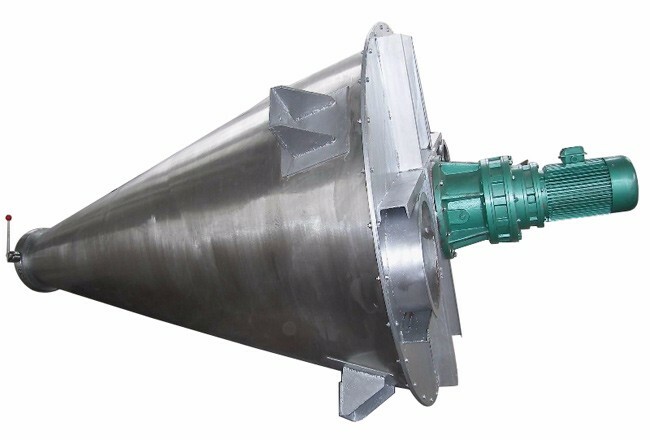 Through the analysis of foreign materials, combined with the design experience, usage and calculation of "single spiral cone mixer" in our hospital, the basic size series, full volume, cone angle and container of "double spiral cone mixer" Height and other parameters. (3) boom, the center rod and the spiral: spiral by the screw and spiral composition, it is a direct working material mixing materials. In order to ensure the rigidity of the screw, reduce the weight, and is conducive to the welding of the screw, the design of the screw .20 steel. Helical blade to a certain diameter and pitch, according to the direction of right-handed welding. The upper end of the screw is connected with the cross arm, the lower end is connected with the center pull rod, and both sides are symmetrical. The triangular form of symmetrical force components connected to the force balance, improve the components of the force state. The lower end of the screw, which can rely on the center tie rod, is independent of the container and does not have to be provided with a fixed bottom support structure at the bottom of the device. (4) discharge valve: the bottom of the device to cancel the bottom of the bearing, is conducive to the discharge. 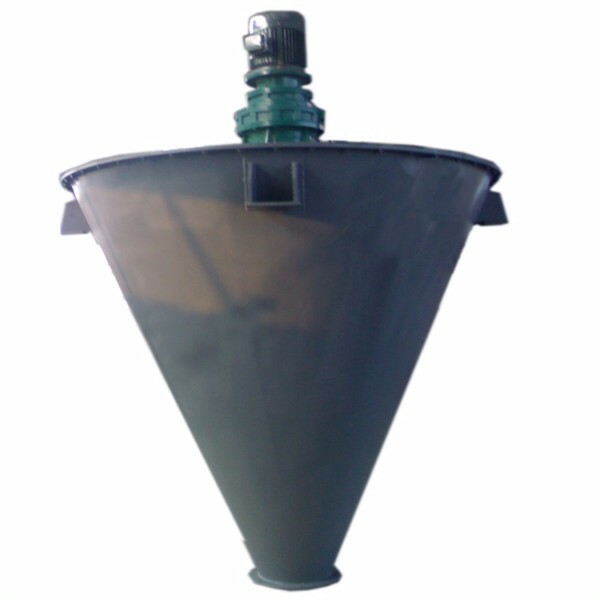 The machine is designed by the two fan plate overlapping discharge valve, the valve structure is simple, does not occupy space, the size of the discharge hole can be controlled, easy to operate, the material can be completely net, and can be easily washable , It is conducive to cleaning and maintenance equipment. 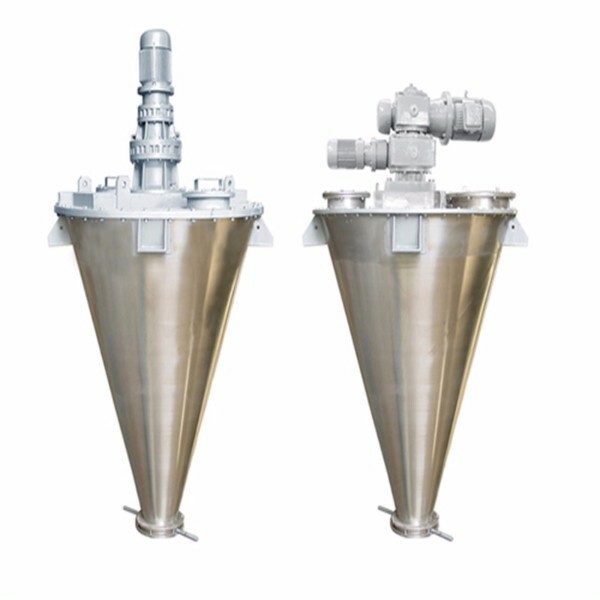 In short, the double helical cone mixer has the advantages of no damage particles, no heat deterioration and no segregation. 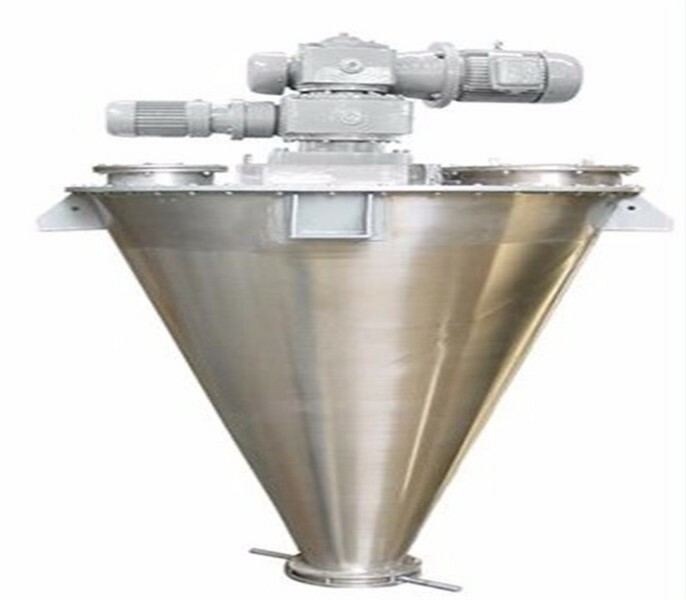 It can be widely used in the mixing of powder materials in the fields of medicine, dye, pesticide, chemical industry, petroleum, metallurgy, glass and gelatin. At present, this series of products has been manufactured by designated factories to meet the needs of relevant industries. We have many machine to satisfied your demands. Like different kneaders, kinds of mixer, various reactors,Three roller grinding machine,Dispersing machine, Resin production line, SMC Sheet Material Equipment, Floram Foam Production Line, Holt Melt Glue Production Line and etc.